Location: Immediately south of New Bridge Street and east of Central Motorway East, A167(M). Technopole Business Park occupies much of the station site. Date closed to passengers: 23.1.1978. The entrance building continued to give access to Manors East platforms for some years. Present state: Demolished although the south end of platform 1 survives. Notes: Known by local people as ‘The Manors’, the name refers to the area on the edge of Newcastle’s city centre which was almost obliterated by the station as it grew into an extravagant nine-platform affair. Passengers travelling from Newcastle towards Benton gained a vivid impression of the station’s vastness, as first the Coast Circle via Wallsend platforms (8 and 9) curved away, followed by the East Coast main line platforms (6 and 7), before the train drew in to platform 1, with numbers 2 (for trains from Benton to Newcastle) and 3 to 5 (for Blyth and Newbiggin services) to the right. Today a single island platform on the East Coast main line, with an hourly local train service, is all that remains. From 1909 until 1969 Manors was officially two separate stations – East and North – but the latter closed in 1978, justifying its inclusion as a ‘Disused Station’. the north-east. A temporary terminus opened close to Carliol Square: known as ‘Newcastle’, this was effectively the first Manors (East) station. Its buildings were not finished until 1842. In July 1846 the Newcastle & Berwick Railway (N&B) absorbed the N&NS, and used the existing North Shields route for about 1½ miles to Heaton Junction for its line which opened as far as Morpeth on 1 March 1847. From another junction on the east side of Trafalgar Street the N&B pushed further into the city centre, to a junction with the Newcastle and Darlington line at the new Central station on 30 August 1850. The former ‘Manors’ terminus was retained as a coal depot, and a new through station was constructed above Trafalgar Street, on the site of the later platforms 6 and 7. This had an office building on the down side, in the angle of the junction. Access between platforms was through one of the arches of the new viaduct. The platforms were extended and given extensive roofing in 1872-3.
twenty years later, to absorb the B&T. Despite owning the two neighbouring stations, the NER was slow to link them. To do so would require the demolition of Trafalgar Goods station, and there was already a link between the two routes at Benton. As traffic grew, the two miles between Newcastle and Heaton, through Manors, became congested. In 1887 the route was quadrupled, and Manors was remodelled. 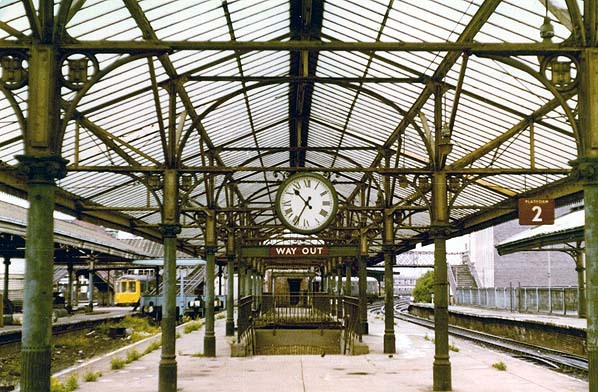 The old down platform and building were retained (as platform 1) but a long island platform (2 and 3, later re-numbered 7 and 8) replaced the old up one, and platform 4 (later 9) was added, its tall, 3-storey curving frontage following the line of Melbourne Street. Shop units occupied the street level space, with waiting rooms at platform level. The enlarged station required a labyrinth of passages and stairways beneath it - likened by one reviewer to the fictional Castle Gormenghast! Access to the platform from Melbourne Street involved ascent of a lengthy staircase; part way up the staircase a tunnel led off to the other platforms. Robust, slate-and-glass canopies were carried on ornate Gothic columns and spandrel brackets. Platforms 2 and 3 (later 7 and 8) had ridge-and-furrow roofing with hipped ends, carried on two lines of columns, sheltering a timber office range including a booking office, towards its south-western end, and waiting rooms. On platform 4 (later 9) the roof ridge ran along the platform. Quadrupling of the line between Manors and Central Station was completed in 1894. The next significant development was beside the railway rather than on it. In 1901 Manors power station opened to supply electricity to the city's tramway system. This competition stimulated not only the electrification of the existing lines between the city and the coast but also the eventual construction of the Manors-New Bridge Street link with new platforms at Manors (North) which opened on 1 July 1909.
range adjoining platform 1. The North station building, approached from Trafalgar Street, was set back behind a wide, triangular forecourt. The core of the building - the booking hall - was a single-storey structure in red brick with a hipped roof, fronted by a large gable and surmounted by a clock cupola. disused when it was damaged by fire in the early-1960s. Extensive glazed roofing sheltered the new platforms, supported by columns with Ionic capitals and spandrels embellished with the City of Newcastle’s ‘Three Castle’ crest. The new station roofing lent a light, airy atmosphere to Manors North in contrast to the more gloomy platforms of Manors East. William Bell was Chief Architect of the North Eastern Railway from 1877 until 1914, when these major changes were made to Manors station. Lavish new buildings featuring large expanses of glazed roofing at Monkseaton, Whitley Bay and Tynemouth, on the Coast line from Manors were also impressive products of Bell’s office: unlike Manors North, they survive to be admired today. North, travelling to Benton, but the traditional ‘Coast Circle’ electric service, starting and terminating at Central station, did not begin until 1917. 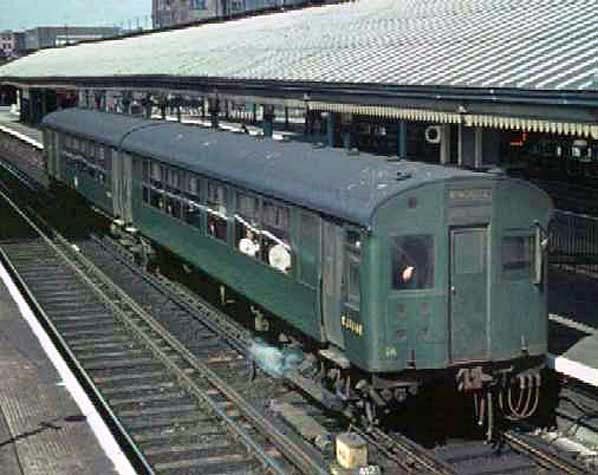 Electric services continued until 17 June 1967, diesel multiple units having been gradually phased in during the previous year to replace the fleet of electric trains that had been operating since 1937. Although in practice one station, and the nameboards bore the name Manors, the old and new parts were officially Manors East and North from 1 January 1909 until 20 February 1969. Some tickets referred to East and North, as did LNER timetables until June 1947. In British Railways days working timetables still distinguished East from North. Public timetables indicated by footnotes that express services from Monkseaton via the East Coast main line called at the East rather than the North platforms. irregular intervals, and occasional services to and from the ‘Riverside Branch’ (the St Peters and Carville route) and Blyth / Newbiggin used the station too. On Saturdays the Blyth / Newbiggin services operated at hourly intervals, terminating in platforms 3, 4, or 5, rather than using Central station. 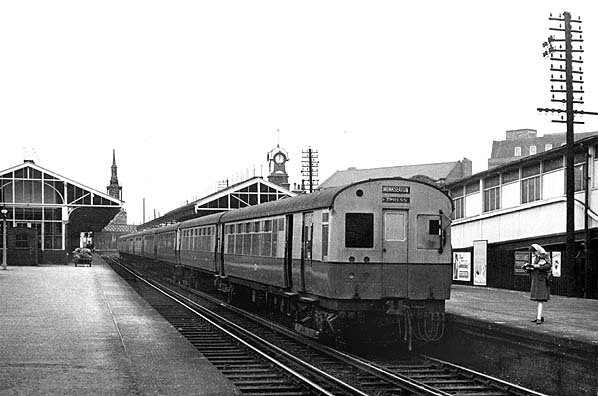 The variety of passenger services began to decline when, on 2 November 1964, Blyth / Newbiggin trains were withdrawn, making Manors North platforms 3 to 5 redundant. The few Riverside Branch trains ceased from 23 July 1973. 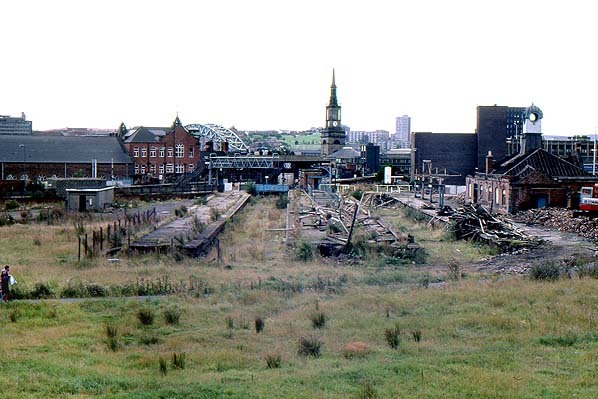 Much more significantly trains were withdrawn permanently from Manors North when the Coast service via Benton ended on 23 January 1978 in preparation for Metro works: Coast trains via Wallsend continued to use Manors East until 11 August 1980. 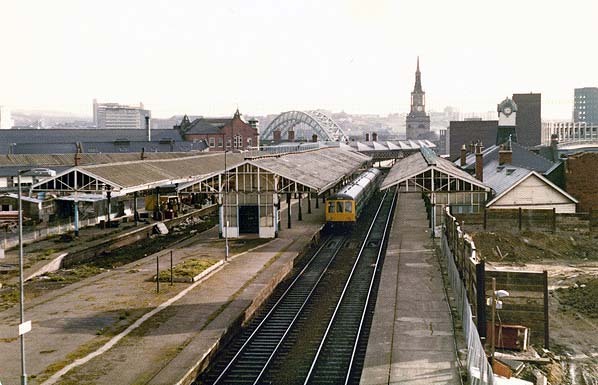 On 14 November 1982 a regular local passenger service resumed at Manors, but using the new underground Metro station on the Newcastle to Coast route. was applied to iron columns and woodwork - though this did not really blend with the tangerine signage! LNER electric ‘mint imperial’ design lamps hung from the roofing of the North station, or were carried on hooped standards on the open platforms. Small LNER name tablets accompanied the lamps: tangerine BR ‘totem’ signs were, sadly, never fitted. Under the East station roofing the electric lighting had LNER brick-shaped diffusers bearing the station name. Tall, vandal-proof lamps arrived in 1971, and ‘corporate identity’ black-and-white signage followed in 1973. From August 1980 only some thirty local services on the East Coast main line called at Manors, but the number has dwindled in 2011 to four southbound on Mondays-to-Fridays (two on Saturdays) and four northbound on Mondays-to-Saturdays, with no Sunday services. a crude, breezeblock shelter, while southbound passengers – if there were any – and Coast-bound passengers, who shared platforms 7 and 8, had to shelter in the subway. 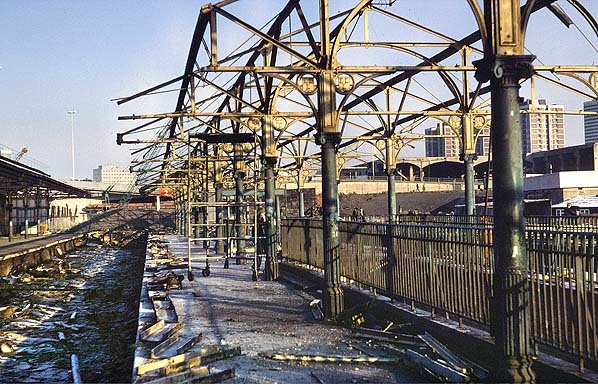 In September 1985 the once-dignified entrance building on platform 1 was being demolished. The cupola, stripped of its clock, rose proudly above the crumbling remains of the booking hall. On the façade a tangerine British Rail Manors sign was still fixed to the gable in front of the turret, accompanied by a modern British Rail sign, reassuring doubters that trains still called. Access to the station was afforded by a lengthy footbridge over the ‘Central Motorway East’. 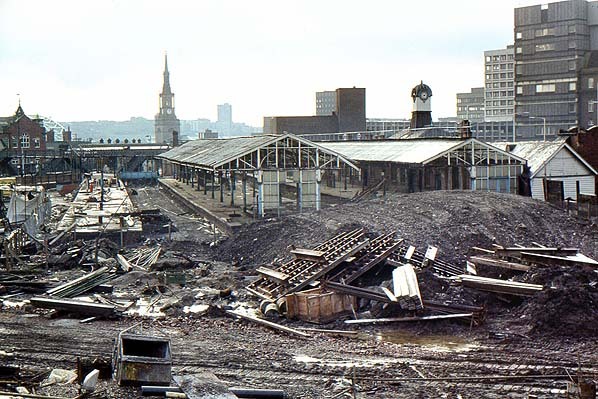 On reaching the unstaffed station the would-be passenger had to navigate through the roofless North booking hall, avoiding chunks of fallen masonry, then along the rubble-strewn former platform 1, overhung by roofing supports awaiting demolition. Beyond this a causeway crossed the old track-bed to platform 2. To catch a train to Newcastle Central a footbridge then had to be crossed. 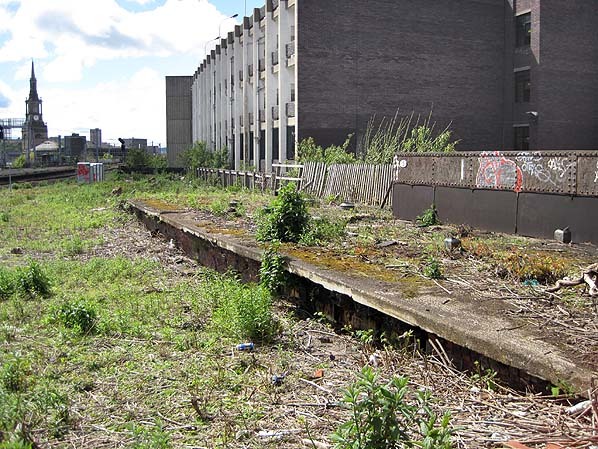 By 1985 platforms 2 to 5 had gone, and much of their site had been landscaped. The platform-level buildings and awnings on platform 9 were removed in 1986.
nearby Manors Metro underground station probably meet workers’ needs. In recent years Manors station has attracted much interest, with lively blog-site discussions on its every feature. 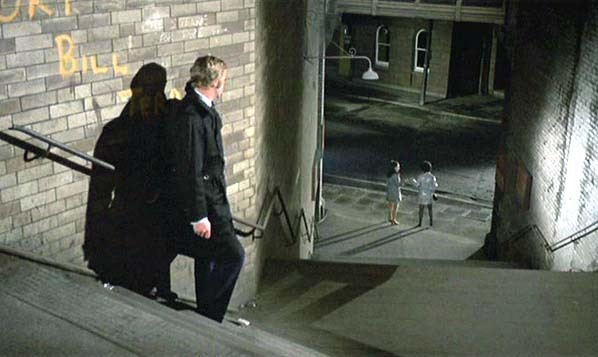 Perhaps the use of its gloomy subway and staircases as a film set in the 1971 cult movie Get Carter, starring Michael Caine, is part of its mystique. Contributors seem amazed that so little remains of such a vast and formerly important transport facility. The clock cupola survives, but it is in South Shields as a feature of the Rattler pub (formerly Marsden Rattler). underground station replaced Manors North, and Northumberland Park was opened in 2005 immediately south-west of the site of Backworth). Tickets from Michael Stewart except 4195 & 5524 CJ Dean and 2568 & 0882 Brian Johnson. 1906 Bradshaw from Chris Hind, 1950 Bradshaw from Nick Catford. Street map from Ali Ford. Route map drawn by Alan Young. To see other stations on the Blyth & Tyne Railway Newcastle - Backworth line click on the station name: Newcastle New Bridge Street, Jesmond, West Jesmond*, Moor Edge, South Gosforth*, Longbenton*, Benton (1st site)*, Benton (2nd site)*, Forest Hall, Benton Square and Backworth (2nd site). An EMU calls at platform 1 in October 1947, bedecked in the blue and off-white livery which was replaced with malachite green in the early 1950s. 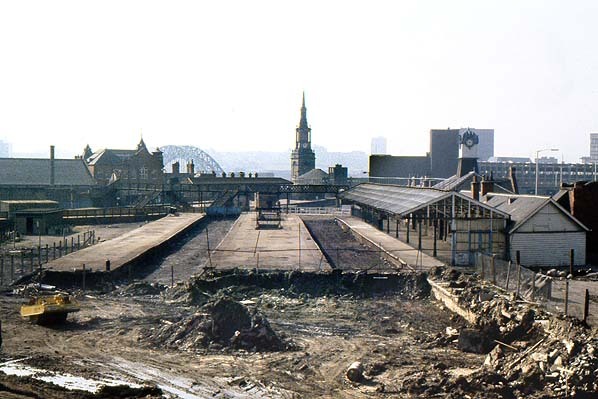 In this view, looking south, the covered ramp from New Bridge Street to the main entrance can be seen; this was destroyed by fire in the early 1960s. 1940 1:2,500 OS Map. Manors (North) and (East) – simply described as ‘Manors Station’ - are shown at their full extent. North station’s five platforms can be seen, with glazed roofing (shown as cross-hatching) covering much of the area. The main building and its triangular forecourt are at the western margin of the station, with access from Trafalgar Street. Further entrances can also be seen: the subway from Trafalgar Street from which passengers emerged by a flight of steps to platforms 2 and 3; and the long, covered ramp immediately west of the site which led from New Bridge Street and delivered passengers to the main entrance. 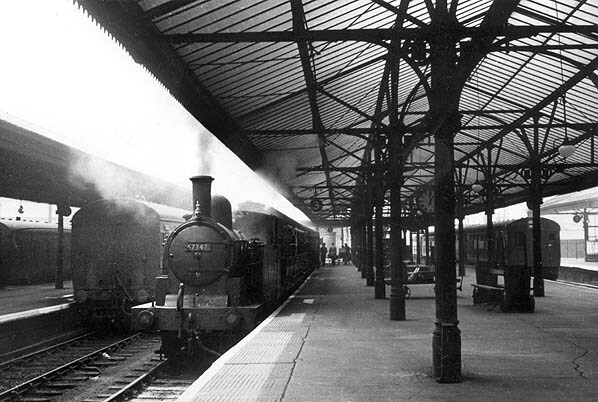 Class B stopping passenger train bound for the Blyth / Newbiggin system waits at platform 3 in April 1952. 67347 is a G5 class 0-4-4 tank, built at Darlington Works in 1901 to a design by Wilson Worsdell. It entered service on the NER carrying the number 436 and was renumbered 7347 by the LNER in November 1946. Withdrawn from 54A Sunderland Shed in March 1956, it was scrapped shortly after. The tracks serving the other two bay platforms (4 and 5) are also occupied. A Coast Circle EMU is calling at platform 2 (right) en route to Newcastle (Central) direct. from the footbridge in 1962. Manors (North) seen from platform 7 of Manors (East) in March 1977. The DMU in the distance is at platform 1 and will travel to the coast via Benton. Looking south from New Bridge Street road bridge towards Manors North in March 1978. Several weeks after closure to passengers a DMU stands at platform 2. It is understood that the section of line from just north of Jesmond (where the Metro route diverged into its tunnel) to Manors North was temporarily being used as a turnback siding Bay platforms 3 to 5, to the left, formerly used by Blyth / Newbiggin services are without tracks. the booking hall on platform 1. Manors (North) looking south from New Bridge Street in December 1979. The bay platforms 4 and 5 have lost their roofing. 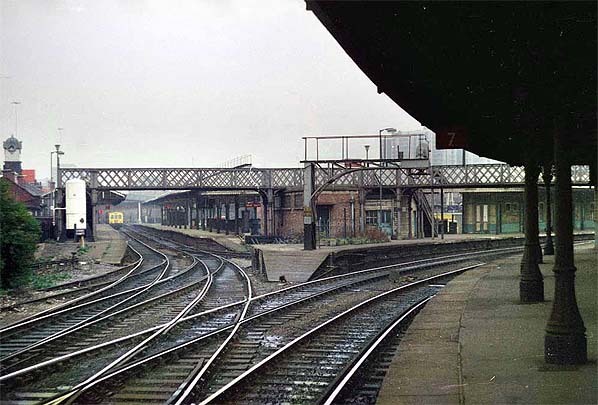 Manors (North) looking north from platform 2 in January 1980. Platform 1 is to the left. Demolition of the roofing over island platforms 2 and 3 is under way. In the background (right) New Bridge Street goods warehouse can be seen. Looking south from New Bridge Street. 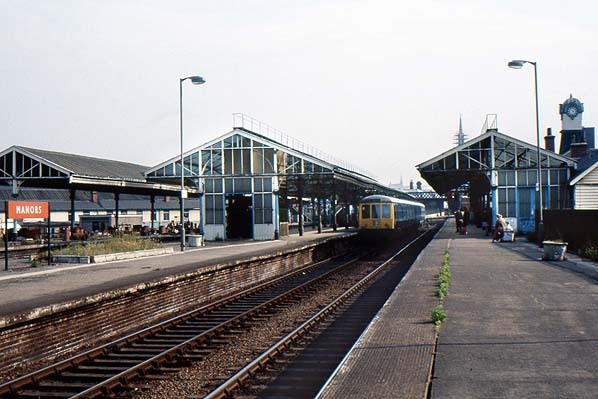 By April 1980 all of the buildings and verandahs on platforms 2 to 8 at Manors had been removed, leaving original buildings only on the disused platform 1 (right) and 9 (in the background. Looking south from New Bridge Street at Manors (North) in September 1985. Demolition of the main building on platform 1 (right) is at an advanced stage. 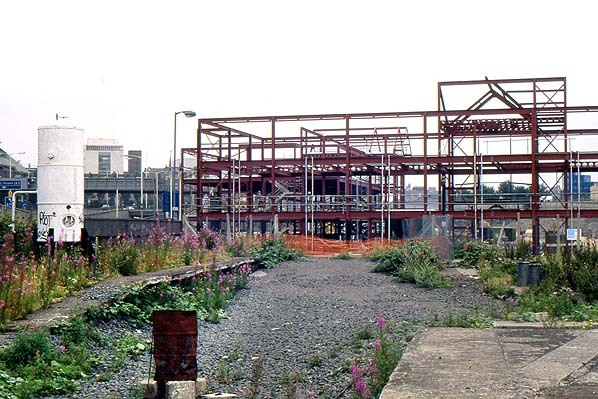 In July 1991 Technopole Business Park is taking shape on the site of Manors (North) station. The southern ramps of platforms 1 (left) and 2/6 (right) are visible on this northward facing view. 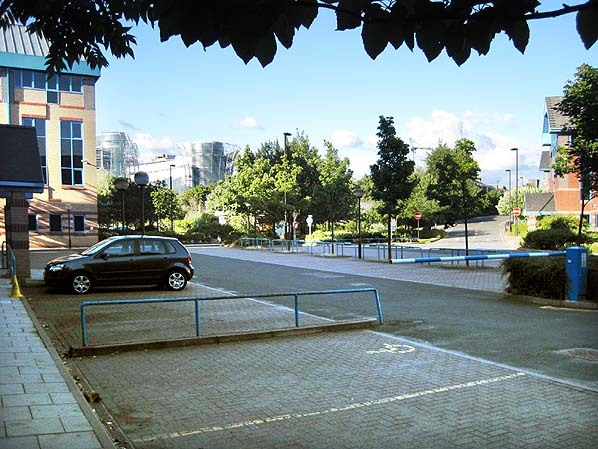 Within Technopole Business Park, the photographer is looking north from a site in the former bay platform area of Manors North station in July 2010. Looking south at the surviving south end of platform 1 in May 2012. A disused section of former platform at Manors East is seen in the background. Manors Metro station (opened in 1982) is underground, and a new, shorter island platform on the site of platforms 7 and 8 of Manors (East) is now used by Northern Rail trains on the East Coast main line.